Lightweight, yet still big enough to get the job done. Versatile, collapsible truck will fit neatly into small spaces for compact storage. Sturdy aluminum frame and decking give this truck the capacity to transport bulky loads with ease. 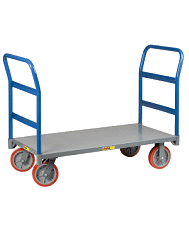 The Wesco Ergo Platform Truck has a quick-release mechanism to unfold the handle. Usable platform area measures: 24"W x 35 1/2"D. The handle unfolds to 41"H working height. 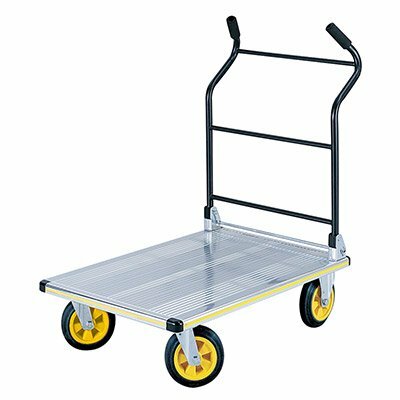 The Wesco Ergo Platform Truck also features 7" diameter solid rubber tires and 660 lb. capacity. Attaching the casters is the only assembly required. Uses: Transporting Crafts to Craftshows, Moving Office Supplies, Transporting Goods to Conventions, General Home Chores. I order the Platform Cart with Telescoping Handle and it is fantastic. Easy to use and fold up while transporting. The deck area is large enough to carry and support a good amount of equipment. The wheel are beefy and roll smoothly. Couldn't ask for anything more from a hand cart kudo's!! Real work horse! Makes our offsite deliveries a breeze. More versatile than any of the push carts used over the years. This is a really well built and functional cart. Its best used on flat surfaces but can go off road as well. It folds easily and is not too heavy or awkward to carry. Absolutely love this cart! This is a sturdy large hand truck. Great for hauling big bags of mulch or top soil around th yard. Handles are really easy to grip especially if you have arthritis. Very easy to assemble. We are retirees and needed to replace a hand truck we had been using for about ten years. This one came fully assembled except for the wheels. Nothing falls off this hand truck because it is so heavy and sturdy and the rubber wheels absorb most of the vibrations. We use it for many more jobs than we originally planned when we bought it. It is better than I thought it would be when I ordered it. The cart was easy to assemble and appears to working as expected. Price was reasonable as well. We bought the Wesco ErgoHandle Folding Platform cart to haul, among other things, boxes of books and other heavy items for shows. The larger solid wheels worked well rolling across some rough pavement, and the ergo handles make it easy to push. It is looks like it will hold up a long time. We are glad that we spent the extra money for a better quality, higher capacity cart, as it cuts down on the number of trips to and from the van. I'm extremely thrilled with the platform cart. It is used almost daily in our venue and fits our needs! I plan to order another cart next year! Great product, well built, has a lot of capacity and durability. 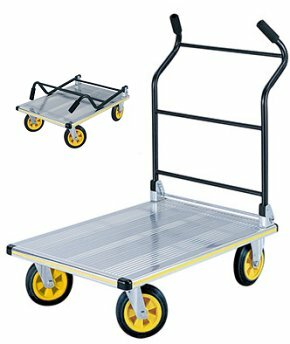 This handtruck is far superior to a similar one made for the purpose by Rubbermaid. Its twice the truck at half the cost. This little truck does the work and than some. The ergonomic handle is great on the guys' back. Thanks Again. Fellow employees overloaded the cart with over 1200lbs of batteries and it still rolls great. However, I do not recommend pushing that much weight. Used this hand truck to move a 450 pound stove. Worked great. We have been very pleased with the Wesco platform cart. It is sturdy and easy to handle. A very good piece of equipment for a very good price. This cart has been very practical for our purposes. We have been pleased with it's preformance. We use it to carry everything from cases of soda to large sound equipment. It was easy to assemble. Well made cart, all hardware was there tapped holes to mount wheels were all good and lined up perfectly with each wheel. No sharp edges or burrs. Would like to see a larger pneumatic wheel option. I have indeed received the handcart and am very pleased with your product. Easy to use and sturdy! It is easy to use. The platform is large enough for big loads and it's sturdy. The only thing about it is that it is a little heavy if you're going to put it in your trunk. I am small and can do it, but it takes a little work. Works great. We have water delivery man put the boxes heavy on the cart. It's easy to maneuver in and out of the garage. Very well built and heavy duty. Really liked it very easy to use.